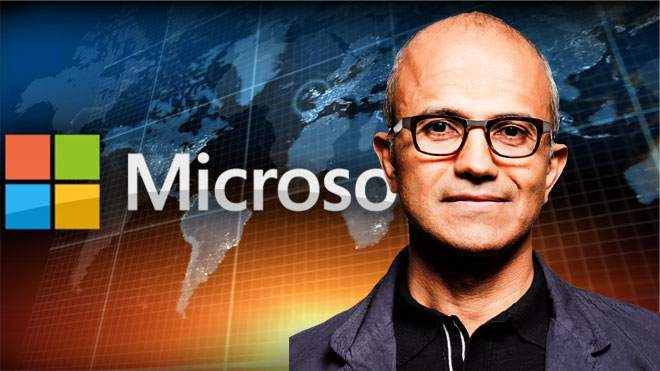 Microsoft reports lower profits for the third quarter of 2014, which was better than analysts had expected. The company’s new chief executive Satya Nadella’s first encounter with Wall Street analysts impressed as he expressed his desire to transform Microsoft, the largest software company in the world, as it struggles to adapt to the new mobile-computing environment. Microsoft’s fiscal year is from July to June. Net income (profit): $5.66 billion. Diluted earnings per share: $0.68. The Microsoft Corporation, based in Redmond, Washington, USA, was founded in 1975 by two friends who were talented in computer programming – Bill Gates and Paul Allen. It grew rapidly and soon dominated the personal computer operating system market with its MS-DOS and Microsoft Windows operating systems. It is one of the most successful startup companies in modern history. Satya Nadella is married and has one son and two daughters. Microsoft’s CEO since Feb 2014. Previously he was executive vice president of Microsoft’s Cloud and Enterprise group. Before joining Microsoft in 1992, he worked with Sun Microsystems as a member of its technology staff. Born in Hyderabad, India (1967). He has a Bachelor of Engineering degree in Electronics and Telecoms from the Manipal Institute of Technology, India, an MS in Computer Science from the University of Wisconsin-Milwaukee, and an MBA from the University of Chicago Booth School of Business. Nadella is an avid reader of Indian and American poetry. He loves the game of cricket, having played in his school team. He says he learned leadership and teamwork from cricket. Devices and Consumer income increased by 12% to $8.30 billion, while commercial revenue registered a 7% rise to $12.23 billion. Microsoft completed the takeover of the Nokia Devices and Services business on April 24th, ending a 7-month wait to renew its venture into the mobile market. The final acquisition price may be a bit higher than the $7.5 billion (€5.44 billion) initially announced last year, Nokia informed today. Approximately 30,000 Nokia, workers are being transferred to Redmond, Washington, a move that has been delayed due to regulatory scrutiny. Microsoft’s acquisition of a device business now gives it more ammunition it can use to catch up with the likes of Google and Apple in the mobile-phone and tablets markets. The takeover means Microsoft is now the second largest maker of mobile phones worldwide (after Samsung) with approximately 14% of the market. As far as the most profitable part of the mobile business is concerned, smartphones, Microsoft is still far behind its main rivals. Apple and handhelds running Google’s Android operating system account for more than 95% of the 290 million smartphones delivered in Q4 2013. Microsoft Windows Phone software is only used by 3% of smartphones. Earlier this month, Microsoft launched the updated version of its Windows Phone software which includes voice search. The platform is being offered free-of-charge to tablet and small phone users as part of what Nadella describes as the company’s “turnaround”.